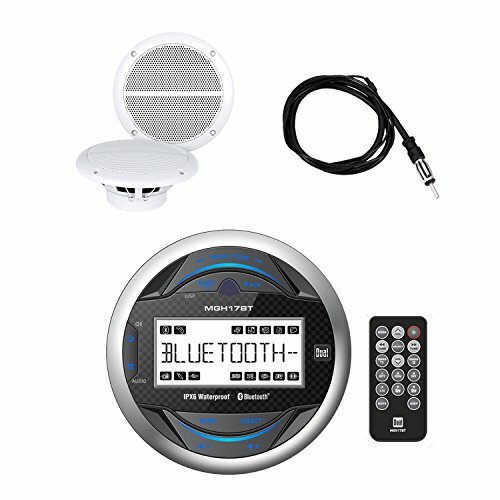 SPEAKERS: Enrock Marine EM602W Dual Weather Resistant Marine Speakers The high-quality 6-1/2 Inch speakers feature one-piece baskets that keep water out and polypropylene cones that will withstand heat and the sun. These speakers are constructed with thick, heavy-duty plastic, assuring you safety and durability in the marine environment. The hardware is equipped with the rust-resistant material, and speaker surrounds are corrosion-resistant. Designed for years of trouble-free operation. RADIO ANTENNA: The Enrock 20W AM/FM Antenna includes a flexible mast for durability, along with a 180 swivel base for increased mounting options. It is corrosion resistant and includes 45 inch cable. Flexible mast. Angled mounting options allow you to install the 20W antenna in the most convenient locations. Corrosion resistant for the marine environment. RECEIVER: Dual MGH17BT is a 3" round IPX6 waterproof stereo designed to withstand heavy splashing and rain. The built-in Bluetooth(R) supports A2DP audio streaming and ACRCP player control profiles. The USB input for MP3 playback also supports up to 1 amp for device charging. AM/FM tuner with 30 stations presets. Rear USB input With MP3 playback and 1Amp charge 1 Pair of rear RCA aux inputs 1 Pair of preamp outputs 2 Band tone control. ASTM B117 Salt Spray Exposure Standard UV Exposure Standard. If you have any questions about this product by DualMarineBundle, contact us by completing and submitting the form below. If you are looking for a specif part number, please include it with your message.